She answers to Kit, but her real name is Kitsune, the Japanese word for fox. 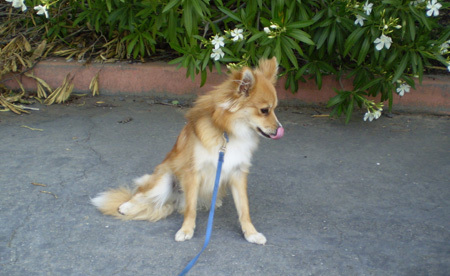 That’s because when we adopted her four years ago today, she looked so much like a fox. We’d been looking for a second dog for over a year and had even spent six weeks with a foster animal with the option to keep, but it didn’t work out. We’d put the word out, and one afternoon it paid off. The owners of a mom and pop kennel called concerning a year old animal that needed a home. Kit had been rescued by a roommate from a couple who mistreated her and were planning to dump her by the side of a highway. She was frightened of men, and at first ran away when I tried to pick her up, yet by the end of the day, she was at home in our home, and after a walk in the park the next morning, she was my new best buddy. She was just over eight pounds when we got her, and her ribs showed. Now she has the opposite problem – she’s on low fat kibble. 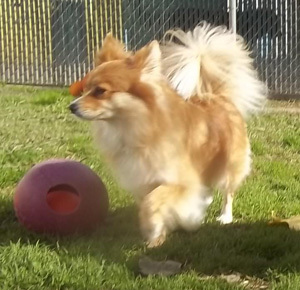 Officially, she’s a Chipom, a Chihuahua / Pomeranian mix, although we suspect there’s something else in there, because she’s bigger than either of those breeds. 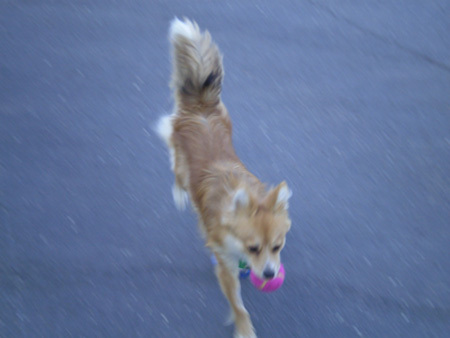 We’ve wondered how much the dog DNA tests cost, sometimes wondering if she really might have a fox in the family tree. Like any complex creature, she’s full of contradictions. She’s as brave as a dog twice her size, and the unquestioned alpha to the others, and yet she’s a wimp when it comes to rain. With tail between legs she’ll duck for cover if the drops start to fall on her arctic quality fur. wakes up, a new half. This entry was posted in Animals, Family and tagged Animals, Dogs. Bookmark the permalink. It’s also funny when you see people who look like their dogs. Most famously, I think, Winston Churchill and his bulldog. But I’ve also seen collections of paired photographs, not that extreme, but you can really see the kinship. That’s true. I forgot about that one too. She’s beautiful – and she does look like a fox. And she’s a lucky dog to have found such a good loving home. Yes, that is really gives us a great sense of satisfaction. What is it that is so endearing about that look dogs have after they’ve done something bad and, as you said, make people ask what kind, as if they had to have one of their own. We used to have a dog we named lo Siento, Spanish for “I’m sorry,” because of that look. Everyone loved that dog and wanted one just like him. Kit is very cute and it’s clear you were meant for each other. LOL! 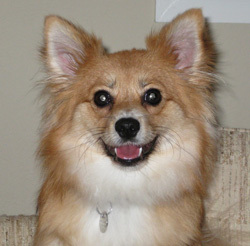 My mom has a dog called Foxy because she too looks like a Fox. Foxy is a legend with all my moms grandchildren – they even have t-shirts with Foxy’s pic on. 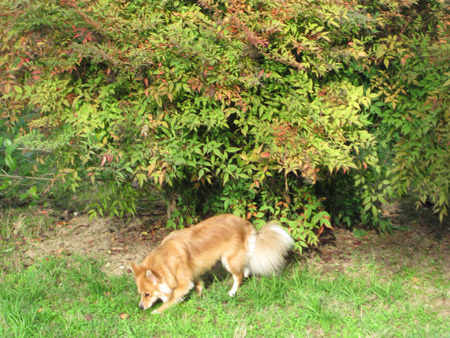 And my nephew thought – until he was 6 yo – that there were dogs, and there was Foxy. He didn’t realise that there were actual foxes too. So the Chicken Licken story took on a whole new angle becuase he thought our Foxy was after the birds!!! She is sweet. Yours look the same. Thank you 🙂 I love them as it seems you do with Kit.